The history of organs in Manitoba is a neglected aspect of the musical, cultural, and church history of the province. A 45-year period around the turn of the century was the “Golden Age” of the organ in Manitoba. More than one-third of all the known pipe organ installations in the province up to the present occurred in this period, many of them in newly-constructed churches. Both the instruments and the recitals played on them were matters of intense public interest. The installation of a new church organ was not only a matter of pride and celebration on the part of the congregation, but it was also a significant event in the musical life of the community. This article presents a brief chronicle of the organthe instruments, the builders, and the players during this period of slightly more than four decades. In Winnipeg, where other religious denominations considered the organ an appropriate aspect of Christian praise, things went more smoothly. Grace Methodist acquired a small reed organ in 1873, and two years later a prominent mill owner presented the Baptist Chapel with a similar instrument. Other city churches, as well as those in outlying areas, also purchased reed organs, and they served these congregations for many years. The reed organ today exists only as a reminder of a by-gone era, but it played an important part in the musical life of the community around the turn of the century. In addition to supporting congregational singing in the churches, reed organs were the focus of religious devotions and entertainment in family parlours throughout North America. Source: Manitoba Free Press, 24 November 1885. An early imported reed organ, built around 1800 by Trayser & Cie, Stuttgart, Germany, was brought from England through York Factory in the mid-1800s, intended for use in a northern diocese of the Anglican church. During the journey the York boat overturned on the Nelson River, but the organ was recovered and brought south to St. Andrew’s, where it was left with a local Sunday school teacher who was also the church choir leader. The organ was designed to be carried by four men using poles looped through metal rings, two on either side of the case; this allowed the organ to be moved to and from nearby St. Thomas Church. This instrument, now nearly 200 years old, is in the museum at St. Andrew’s-on-the-Red Anglican Church, near Lockport. 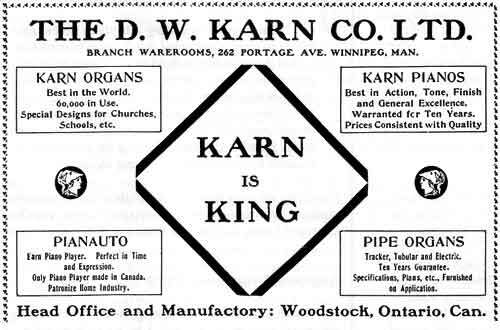 Most of the reed organs in Manitoba churches and homes were built in southern Ontario by a few of the larger companies founded in the 1870s and supplied through their agents or retail outlets in Winnipeg. Before rail connections were established with Eastern Canada, organs were transported across the northern United States to St. Paul, Minnesota, and then north to Winnipeg by river boat. One of the largest manufacturers was the Bell Organ and Piano Company (or the Bell Piano and Organ Company, depending on its priorities); one of their large two-manual, 16-stop reed organs, with “mouse-proof” pedals, was in-stalled in St. Alban’s Anglican Church, Oak Lake, around 1890, and it is still in use. Other prominent Ontario makers included the Dominion Organ and Piano Company, the W. Doherty Piano and Organ Company, and the Thomas Organ Company. A large two-manual, 20-stop, Doherty instrument, built around 1904, originally in St. Albans Anglican Church, Snowflake, is still in regular use in St. Andrew’s-on-the-Red Anglican Church. There was competition from American sources, however. 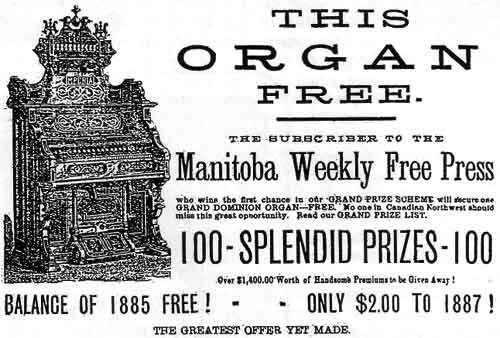 In the mid-1870s Winnipeg newspapers carried advertisements by a dealer in St. Paul, Minnesota, offering pianos and organs to Manitoba residents, free of duty. The Manitoba Music Store in Winnipeg offered instruments by both American and Canadian makers, as well as tuning, repairs, and instruction. Several reed organs from the Estey Company, Brattleboro, Vermont, were supplied to Manitoba churches through a Winnipeg agent in the 1880s; a one-manual, 19-stop instrument, with ornamental pipes, now electrified, is still in use in St. Andrew’s-on-the-Red Anglican Church. Although many thousands of reed organs were sold during the peak period of their popularity between 1870 and 1910, their decline in popularity accompanied other innovations in musical entertainment, such as the player piano, the gramophone, and the radio, all of which transferred music appreciation in the home from a participatory activity into a passive one. Few reed organ manufacturers remained in business after 1930, and apart from those few instruments still being played in several rural Manitoba churches, the remaining survivors are collector’s items in private homes and museums. The history of pipe organs in Manitoba is largely a chronicle of events in Winnipeg. An expanding urban population, increasing wealth, the growth of the various religious denominations, and the flowering of musical culture all resulted in the construction of a large number of churches within a relatively short span of time. In St. Boniface three Roman Catholic Cathedrals had been erected in succession (1822, 1833, 1862) before other denominations began to construct their houses of worship in Winnipeg. The first major boom in church building construction began in the 1880s and extended to about 1915. Many of Winnipeg’s largest and finest churches were built in these early years. Since many of the business, political, and community leaders, predominantly Anglo-Saxon in origin, were prominent members of the larger city congregations, they undoubtedly exercised considerable influence on decisions regarding the construction of church buildings, as well as on the installation of organs. 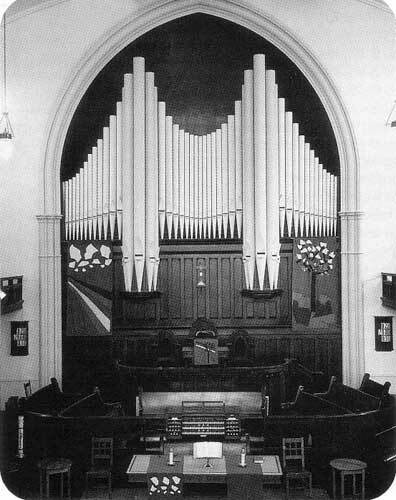 Another Bolton organ was installed in Christ Church Anglican, Winnipeg, around 1886. However, if any other Bolton organs were installed in Manitoba churches, none of them survive, and there is no remaining evidence of the builders’ activities in the area. The following sections provide brief accounts of some of the major organ installations in Manitoba in the early years. A large church organ arrived last Monday on the International for the Cathedral of St. Boniface. It was made in Montreal by Mr. Mitchell, the celebrated organ builder. It is the first church organ imported into the North-West, it is 19 ft high, 12 ft 6 in wide, and 11 ft deep. The case, which is already put up, is in the Grecian style, which is well adapted to the architecture of the Cathedral. The Organ weighs 12,000 pounds and costs over $3,200. The organ was the gift of a group of friends of Monseigneur Alexandre Tache in recognition of the thirtieth anniversary of the date of his departure from Quebec for the mission at Red River, and of the twenty-fifth anniversary of his appointment as Archbishop of the diocese. At the time of the installation of the organ, about $1,100 had been raised by pupils and associates from the seminary in St. Hyacinthe, Quebec. Although the specifications of the organ were not given, the dimensions of the instrument suggest that it may have had about twelve ranks of pipes. The organ is from the establishment of Messrs. S. R. Warren & Son of Montreal and Toronto, and does great credit to that well-known firm. Its price is $3,000, and it is a powerful instrument, containing two rows of keys and full pedale, and twenty-four draw stops. Some of these are of exquisite sweetness, particularly the Claribel Flute, the Viol di gamba, and the Oboe in the swell, and the Dulciana Company, 1912. Casavar and the Harmonic Flute in the great organ. When Holy Trinity Church moved to a new location in 1884, the Warren organ was relocated and enlarged by the builder. It was claimed that the renovated instrument was the largest west of Toronto. The organ was further enlarged eight years later. In 1912 it was replaced by a large four-manual, 50-stop instrument, manufactured by the Canadian Pipe Organ Company, founded two years previously in St. Hyacinthe, Quebec, by some staff of Casavant Freres who had decided to go into business on their own. The new organ was again described as the finest in the Canadian West. Holy Trinity Anglican Church, 1884. S. R. Warren & Son Organ, 1884, 1892. Canadian Pipe Organ Company, 1912. Casavant Freres Console, 1950. The chief characteristic of the organ is its powerful tone, the reeds are voiced to a high pressure, and perhaps a little too coarse to suit the sensitive ear, but upon the whole it is well suited to the purpose for which it is intended. Thirty-five years later, the Mitchell organ was replaced by a new two-manual, 18-stop Casavant instrument. 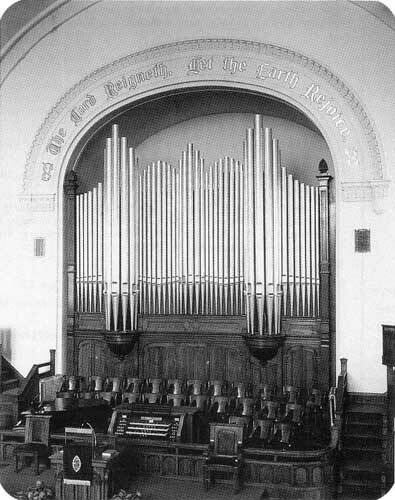 This organ, installed in 1918 at a cost of $3,692, would serve the church for a further forty years before being rebuilt by the same company. Winnipeg’s Victoria Hall, built in 1883 and later renamed the Winnipeg Theatre and Opera House, was the site for many concerts, musical events, and other entertainments in the early years. Some church congregations held services in the Hall before their own buildings were completed. One of the ventures of the Winnipeg Oratorio Society, which performed there, was to provide an organ for this building. The newspaper account of the forthcoming installation in 1884 pointed out that the 11-stop instrument, whose builder was not identified, was intended to be used instead of a string band and would equal an orchestra of about thirty performers. The list of stops included many ranks imitative of orchestral instruments: viol di gamba, horn, concert flute, clarionet, flute, piccolo, violin, and bass. The first pipe organ in Grace Methodist Church was installed by S. R. Warren & Son in 1885, but a few years later it had deteriorated to the point of receiving an ultimate insult: “The organ at Grace church has arrived at that state of perfection when it is difficult to tell it from a circus calliope.”  When a new three-manual, 34-stop organ was installed by R. S. Williams & Son, Oshawa, in 1894, the decrepit instrument was transferred to Westminster Presbyterian Church. An even more magnificent organ was acquired by the church in 1907: a four-manual, 46-stop instrument built by Casavant Freres, the largest organ in the history of the company to that date. 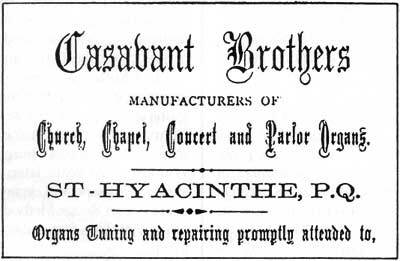 The Casavant brothers, Joseph-Claver and Samuel-Marie, had established their factory in St. Hyacinthe, Quebec, in 1879, following several years touring Europe, inspecting organs, and visiting workshops. In the following years their fame spread steadily beyond the towns and cities of Quebec. The first Casavant organ in Manitoba was installed in the Parish Church, St. Norbert, just south of Winnipeg, in 1899. During the period under consideration, the company installed eighteen complete instruments in Winnipeg and five in rural towns. This three-manual, 37-stop instrument, later enlarged and refitted in 1959, is the present organ in All Saints Church. In 1912 the church replaced the organ with a four-manual, 49-stop Casavant organ at a cost of $10,500. This organ, which has undergone several modifications since that date, is the grandest organ in Winnipeg in the Romantic tonal tradition. For this reason it has served as the location for many concerts and recitals by local players and world-renowned organ virtuosos over the years. Source: Winnipeg Town Topics, 10 January 1903. The organ was only in use for about three years, when it was replaced by a three-manual, 29-stop instrument, installed by Casavant Freres in 1906 at a cost of $5,050. Light and color were transformed into waves of melody at Augustine church last evening before a delighted audience of between seven and eight hundred music lovers, assembled at the first of the two inaugural recitals on the new organ by Mr. Clarence Eddy, a pastmaster on the great church instrument. The church is as new as the organ so there were no grim ghosts of by-gone Covenanters to protest against the introduction of a musical instrument in the kirk, but even had there been they would have been soothed by the carnival of sound which the magnificent instrument produced under the master touch of the world-wide famous American organist. The Augustine organ is the earliest instrument installed in Winnipeg which still remains active, although it has undergone refitting and renovation several times in the intervening years. Augustine Presbyterian Church, D. W. Karn organ, 1905. Fort Rouge Methodist Church, 1911. Casavant Freres organ, 1911. In the early days organ recitals in the larger churches were played before capacity audiences, and they were much more frequent than they are today. Sometimes they were shared performances involving church choirs, vocalists, or other instrumentalists. A number of Winnipeg organists were particularly active, and the newspaper columnists followed their careers with sustained interest. On one occasion he travelled to New York to play at one of the Episcopal churches there. He was musical conductor of the Musical and Operatic Society, and also of the Madrigal Society, before his untimely death of consumption in 1887 at the age of thirty-six. Christ church was well filled last evening by a music loving audience, who had gathered together to hear and appreciate what is not too often heard in this city, high-class music, well played on the organ. To very few women is given such power over the master instrument as to Miss Holmes, who is the organist of Grace church. Without apparent effort, she handles the keys in a manner that proves her exceptional ability, for a woman, on the organ. There is probably no instrument which has so engrossed the public attention, as well as Musicians generally, as the organ, embodying in its completeness almost all the principal effects obtained from band or orchestra in solo as well as ensemble playing, even surpassing these in some respects, and as capable of the most delicate pianissimo as the thundering forte. When Zion Methodist Church installed a new three-manual Casavant organ in 1905, the new organist Fred M. Gee was at the console. Gee emigrated from Wales to Winnipeg in 1902 at the age of twenty and opened a studio to teach piano and organ. In the following year he joined the staff of the Winnipeg College of Music and became organist-choirmaster of Westminster Presbyterian Church. For several years after his arrival in Winnipeg, until around 1907, he was referred to as F. Melsom Gee, perhaps to preserve a family identification with his father, Melsom D. A. Gee, who followed his son to Canada in 1906 and served as organist at All Saints’ from 1907 until his death in 1921. Fred Gee served as organist at several churches, including six years at All Saints’ beginning in 1925, and often played inaugural recitals elsewhere. He established Winnipeg’s Celebrity Concert Series in 1927, later described as the largest on the North American continent. As a full-time impresario, Gee brought many world-renowned musical artists to perform before large, enthusiastic audiences. A few months before his death in 1947, Gee was the soloist in MacDowell’s Piano Concerto No. 2 with the visiting Minneapolis Symphony Orchestra, conducted by Dimitri Mitropoulos. Dann’s recitals drew large crowds, and their frequency clearly reflected their sustained success with the musical listening public. Dann served as organist at Grace Church and held his teaching appointment at Wesley College until he left Winnipeg in 1923 for the United States, where he later became organist and choirmaster at a new one million dollar church in Pasedena, California, in 1924. Winnipeg was host to some of the world’s most renowned organists during this period; most of them came from the United States, several from England, and prominent Canadian players were also represented. Advance notices of their appearances were followed by lengthy and mainly appreciative reviews of their recitals. The first reported recital by a visiting organist took place at the Central Congregational Church in 1890. It was given by the touring English recitalist Frederic Archer who, according to the English Globe, “is now the greatest of modern organists ... 2,000 organ recitals at the Alexandra Palace.” For an admission fee of 50 cents, the audience heard a program comprised chiefly of transcriptions of orchestral or operatic works by familiar composers. His return to the city early in the following year was again accorded an enthusiastic reception. In succeeding years, Winnipeg audiences heard recitals by these performers: J. Warren Andrews, Minneapolis, at Grace Church in 1894; Frederick H. Torrington, principal of the Toronto College of Music, at Grace Church in 1898; William C. Carl, the New York organist who was on his way to give an inaugural recital in Dawson City, Yukon, at Grace Church in 1903; Rosa d’Erina, the distinguished Irish prima donna and organist, at St. Boniface Cathedral in 1905; Arthur Dunham, the organist at Sinai Temple in Chicago who had received a testimonial from the famous French organ virtuoso and composer Charles-Marie Widor, at Knox Church in 1906 and 1914; Edwin H. Lemare, the expatriate English organist and Paderewski of the organ who became a performing superstar of the organ in the course of world-wide tours, at Grace Church in 1908; Lynnwood Farnam, the Canadian organist who became a legend in his own time by committing 200 pieces to memory and playing 500 recitals by the time he was thirty-five, at Augustine Church in 1908; William Hewlitt, a co-director of the Royal Hamilton Conservatory of Music and heralded as one of the most brilliant players in the country, at Broadway Church in 1909; Gatty Sellars, the English organist who was accompanied by the King’s Trumpeter, at Grace Church in 1911 and St. Andrew’s Church in 1912; Henry Woodruff, Minneapolis, at Knox Church in 1913; Albert D. Jordan, the Canadian recitalist who had served as organist at the Panama-Pacific Exposition in San Francisco, at Westminster Church in 1915; Herbert A. Fricker, former city organist of Leeds, England, who came to Canada to conduct the Toronto Mendelssohn Choir, at Westminster Church in 1919; Ernest MacMillan, who eventually would become recognized as Canada’s musical elder statesman, at Westminster Church in 1919; and T. Tertius Noble, formerly organist of Ely Cathedral and York Minster before settling in New York, also at Westminster Church in the same year. In the four decades preceding 1920, there were 111 reported recitals, consisting of 733 selections in all. Slightly more than one-third of all the pieces performed were transcriptions of a wide range of works by the major composers of the eighteenth and nineteenth centuries. The most frequently performed pieces were derived from Wagner’s operas Lohengrin, Parsifal, and Tannhaiiser; and Handel’s choral works, including his ever-popular Hallelujah Chorus and Largo. Haydn was represented by arrangements of his symphonic and chamber works. Audiences also heard organ interpretations of marches by Gounod (Marche militaire), Mendelssohn (War March of the Priests from Athalie), and Chopin (Funeral March), along with arrangements of Grieg’s Peer Gynt Suite and Dvorak’s New World Symphony. Transcriptions of Von Suppe’s Poet and Peasant Overture, as well as of Beethoven’s overtures and some of his piano pieces, were also presented. As for original works, Alexandre Guilmant’s organ compositions were the most frequently played, led by his Marche funebre et chant seraphique; the earliest reported performance of his Sonata in D Minor, written in 1874, was in 1885. Bach’s toccatas, preludes, and fugues began to be played often, but almost none of his chorale preludes; more than half of their performances were by several visiting recitalists. The first reported performance of his dramatic Toccata and Fugue in D Minor was in 1883. Mendelssohn was first represented in 1885 by his Sonata No. 1 in F Minor, composed about forty years earlier. Pieces by Louis Lefebure-Wely, the fashionable Parisian organist who demonstrated instruments of the leading French organ builder Cavaille-Coll in the mid-1800s, rapidly became recital favourites; one of his works, the Offertoire in G, was played in the first known organ recital in Winnipeg in 1878, about ten years after its publication. However, the works of Charles-Marie Widor were not included in the programs of touring organists until 1905. Interest in the compositions of Edwin H. Lemare escalated following his recitals in Winnipeg in 1908, and local organists included many of his lighter worksparticularly his Andantino, later popularized as Moonlight and Rosesin their programs for many years. The compositions of Alfred Hollins, the blind English organist, began to appear in the programs of both visiting and local players at least a decade before his visit to Winnipeg in 1926. The audiences at organ recitals probably consisted of parishioners of all the major churches and members of the general public possessing different degrees of musical enlightenment, along with the leading musical people of the city”the tutored and untutored alike,” as one newspaper commentator described them. A “full house” at a large church would have amounted to a crowd of over 1,000 people. The population of Winnipeg around 1900 was about 40,000, and although it more than tripled within a decade, it is evident that attendance at organ recitals was a significant aspect of musical culture. These musical-social events were but one manifestation of intense musical activity that included the forming of bands, church orchestras, choral societies, and choirs, as well as the establishment of several musical conservatories, music teachers’ associations, and music clubs, and the inauguration of the Manitoba Musical Competition Festival. Moving picture theatres were the chief form of popular entertainment in the cities and towns of Manitoba and elsewhere in the early years of the twentieth century. The larger Winnipeg movie houses also had resident vocal soloists, instrumentalists, and orchestras which gave brief concerts before screenings of motions pictures or during intermissions. Vaudeville acts and sometimes local military bands were featured in these events, too. Theatre organs first were used to provide musical backgrounds to the action in silent movies. Sometimes these sonic backdrops were improvised spontaneously by the organist, sometimes they were adaptations of composed music. In some respects the theatre organ was a competitor of the orchestra, for the pipe ranks and stop lists of these organs mimicked orchestral instruments. They were also equipped with a variety of percussion devices, such as drums, traps, xylophones, bells, and chimes. Organ consoles were elaborately decorated structures, often of coloured glass backlighted to silhouette the player. Sometimes they were mounted on hydraulically-operated platforms which allowed the organist, seated at the console, to rise dramatically into the audience’s view from beneath floor level, playing all the while. Modern theatres have for some time been equipped with splendid pipe organs. Good orchestras have been introduced, and are now a recognized feature. The music is one of the chief attractions. Some theatre organists earned a living out of this activity, while others occupied posts as church organists at the same time. Their careers, involving moves from one theatre to another or presiding at the opening of a new instrument, were reported in the entertainment sections of the newspapers, perhaps in the belief that their fans would want to follow them from theatre to theatre. The installation of the large theatre organ in the Province Theatre in Winnipeg in September 1917 created a high level of interest. 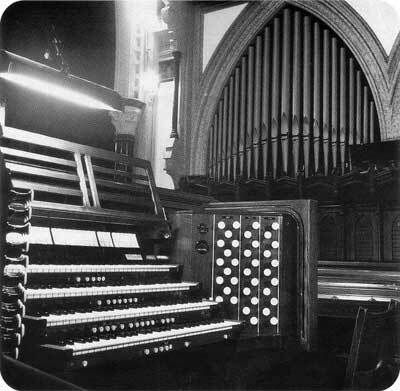 The three-manual, electric-action instrument (claimed to be the only organ in Winnipeg so equipped), containing 2,000 pipes, was supplied by the Toronto organ builder C. Franklin Legge. The $20,000 instrument also had a self-playing mechanism which allowed the instrument to perform on its own in the absence of a trained organist. The organ was formally opened by George E. Metcalfe, “The Organist Supreme” from the Pacific Coast, who amused the theatre customers with a steady stream of improvisations on the “Wonder Organ” throughout the afternoon and evening. At the time, the theatre was featuring the hand-coloured film “Mayblossom,” made in France by Astra-Pathe. had a career as a church organist before and after his experience in Winnipeg cinemas. Born in England in 1875, he was appointed organist in a church in Burton-on-Trent at the age of fourteen. After coming to Canada in 1903, he lived in Toronto and worked for a while with F. H. Torrington, principal of the Conservatory of Music, then moved to Chatham, Ontario. He was a church and theatre organist briefly in Detroit, Michigan, before coming to Winnipeg around 1918 to play at the Province Theatre, then at the College, Dominion, and Starland theatres. In 1925 he moved to Brandon, Manitoba, to play at the Strand theatre, but not for long. By the year’s end Dolman was back in Winnipeg, this time at the Capitol Theatre. There he inaugurated a daily series of “twilight recitals” in the late afternoon and early evening, when he presented a mix of music by modern masters, earlier composers, and popular numbers in vogue with the younger set. In 1928 he moved to Kenora, Ontario, to become organist at Knox Church in that town, where he remained until his death in 1947. The 1920s marked the height of fashion for cinema organs. Several of the larger movie theatres in Winnipeg installed pipe organs in this period, and the arrival of a new instrument was a matter of intense interest on the part of the popular musical establishment and the entertainment industry. However, with the advent of the first sound-synchronized “talkies” in 1928, the role of the theatre organist began to change. With the gradual demise of silent motion pictures, cinema organists still continued to provide musical entertainment before picture showings and during intermissions, but these practices eventually were discontinued as the talking movies came to be regarded as self-sufficient entertainments in themselves. The Winnipeg Centre of the Canadian College of Organists was established in 1923 by some of the city’s leading organists. This small but enthusiastic group sponsored recitals by local and visiting players and arranged special events for the improvement of church music generally. The 1920s were the peak period of organ recitals, and the 1930s were almost as active. The frequency of new organ installations diminished over the succeeding decades, particularly during the years of World War II, when materials were in short supply. Many renovations of existing instruments were undertaken in the 1950s. However, only a few of the churches built after this time acquired pipe organs, preferring less costly electronic instruments instead. The past four decades have been marked by renewal, consolidation, and modest growth in the fortunes of the organ. Interest in the organ and its music is still relatively strong today, considering the various musical and performing arts alternatives, as well as the other forms of cultural entertainment now available. However, in terms of organ installations, recitals, and intensity of public interest in the King of Instruments and its players, the period of the “Golden Age” of the organ remains unsurpassed in the history of music in Manitoba. Research for this project was conducted during the second half of 1992 and the first half of 1993; a six-month period of full-time activity during this time was made available through a research-study leave from The University of Manitoba. This article is an adaptation of one chapter of a book, The Organ in Manitoba: the Instruments, the Builders, the Players, and the Critics, to be published by Windflower Communications, Winnipeg in the summer of 1995. 1. “Les cathedrales de saint-Boniface,” La Liberte,12 July 1972, p. 24; Neil Bingham, A Study of the Church Buildings in Manitoba of the Congregational, Methodist, Presbyterian and United Churches of Canada (Winnipeg: Manitoba, Historic Resources Branch, 1987); Kelly Crossman, A Study of Anglican Church Buildings in Manitoba (Winnipeg: Manitoba, Historic Resources Branch, 1989). 3. W. J. Healy, Women of Red River (Winnipeg: Russell, Lang & Co., 1923), pp. 77-78. 4. Alexander Begg and Walter R. Nursey, Ten Years in Winnipeg: A Narration of the Principal Events in the History of the City of Winnipeg from the Year A.D., 1870 to the Year A.D., 1879 Inclusive (Winnipeg: Times Printing and Publishing House, 1879), pp. 81, 117. 6. “Les orgues de Saint-Boniface,” La Liberte, 12 July 1972, p. 25. 7. T. F. Classey, “19th Century Canadian Organs,” The York Pioneer,1966, pp. 30-32. 8. Ruth Whitlaw, Deloraine, Manitoba, letter to the author, 10 November 1992. 9. Winnipeg Town Topics (hereafter TT), 9 August 1902. 10. “Few Pipe Organs When Winnipeg was a Hamlet: Diary of the Late James W. Matthews Recalls Early Instruments and Players,” Manitoba Free Press (hereafter FP), 13 December 1924. 11. “Opening of the New St. Andrew’s Church Organ,” TT, 26 March 1904. 12. “Baptist Church,” FP, 9 March 1883. 13. “L’Orgue de St. Boniface,” Le Metis,17 June 1875. 14. “The Church Organ of St. Boniface,” FP, 16 June 1875. 15. “Les orgues de Saint-Boniface,” La Liberte,12 July 1972, p. 25. 16. “Holy Trinity Organ Recital and Sacred Concert,” FP, 12 July 1878. A similar account is given in Gegg and Nursey, p. 191. 17. “St. Mary’s Church: Inauguration of the New Organ--The Recital and Sacred Concert--The Church Crowded,” FP, 21 April 1883. 18. FP, 12 January 1884. 19. Winnipeg Town Talk, 21 March 1891. 20. “The New Organ: Inaugural Recital by mr. Andrews of Minneapolis,” FP, 10 December 1894. 21. FP, 4 January 1908. 22. Stuart Kolbinson, Victoria, B.C., “Some notes regarding Opus 301,” for the author, to Casavant Freres, 1992. 23. “Birtle, Man.,” The Musical Journal, 15 April 1888, p. 63. 24. Winnipeg Siftings, 23 February 1884. 25. S. R. Warren & Son, to C. J. Brydges, Ottawa [Land Commissioner of the Hudson’s Bay Company and Honorary Treasurer of the Synod of Rupert’s Land], 28 March 1884. 26. FP, 7 November 1891. 27. History of All Saints’ Church, n.d.
28. FP, 15 April 1899. 29. Winnipeg Tribune, 22 April 1899. 30. TT, 31 October 1903. 31. FP, 22 February 1905. 32. TT, 27 April 1907. 33. FP, 18 June 1888. 34. FP, 11 November 1885. 35. FP, 19 May 1892. 36. TT, 1 October 1898. 37. FP, 12 September 1900. 38. TT, 1 June 1901. 39. TT, 5 October 1901. 40. TT, 19 October 1907. 41. TT, 8 May 1909. 42. “Recalling Early Organists: From the Diary of the Late Jas. W. Matthews,” FP, 3 January 1925. 43. “Few Pipe Organs When Winnipeg was a Hamlet: Diary of the Late James W. Matthews Recalls Early Instruments and Players,” FP, 13 December 1924. 44. FP, 31 August 1918. 45. “Wesley College to Inaugurate Music Department,” FP, 14 September 1918. 46. “Music,” TT, 17 February 1912. 47. “Music,” FP, 23 March 1918. 48. FP, 21 September 1918.